The 8-Mode air fryer by Lidore can be purchased for around $120. Like all air fryers, it was designed with the intent of helping you enjoy healthier cooking- without having to sacrifice crispiness or flavor. So, how does it stand up against other air fryers? Let’s find out. One of the best things about this air fryer is all of the accessories that are included with the machine. With most air fryers on the market, you end up paying for the air fryer itself and a fry basket. If you want the baking, grilling, or other components, you have to purchase them separately. However, the Lidore air fryer comes with a low/high rack, skewer, baking pan and baking cage, tongs, chicken fork, and e-book of recipes. The external parts of this fryer are purple and white. It’s a really nice color that you do not see in a lot of air fryers. The Lidore air fryer is small enough to be stored in the corner of a small counter, however, it is very tall. This makes it impossible to use somewhere that has cabinets hanging overhead. Something else to note is that this fryer only uses Celsius temperature settings, so if you are from the United States, you will need to learn how to adapt to cooking with Celsius. One thing that can be said about the construction of the fryer is that it uses its size well. A common complaint with other fryers is that they are really large on the outside and smaller on the inside. The 8-mode fryer by Lidore, however, has the potential to cook a 4 pound whole chicken without being larger than other fryers. The size of the cooking compartment is rather impressive in relation to its overall size. You can fit a 4 pound whole chicken, boneless ham, or pork roast in it. The oven is the perfect size for making appetizers for 5-6 people or feeding a small family of 4 (maybe more if you are roasting meat). For the most part, this air fryer is easy to use. It has a digital display that allows you to set a cooking timer and temperature. It also has several pre-set temperatures for cooking. The only downside is that the included eBook of recipes is a bit unclear of what mode food should be cooked on. Also, if you are not familiar with Celsius, you may need an app to convert Fahrenheit to Celsius. The parts of the air fryer are fairly easy to clean. The non-stick parts of the machine work very well so that foods don’t usually stick. You can usually wipe clean. One thing to mention is that you will need to clean the parts even if they don’t look dirty after cleaning, because it can cause an oily residue to build up. This air fryer has the ability to BBQ, make popcorn, toast, grill, stir fry, air fry, bake, and roast. The quality of the food that comes out of this air fryer is great. When you use it to make popcorn, all of the kernels get cooked. The air fried foods taste delicious, especially if you use a little bit of oil. 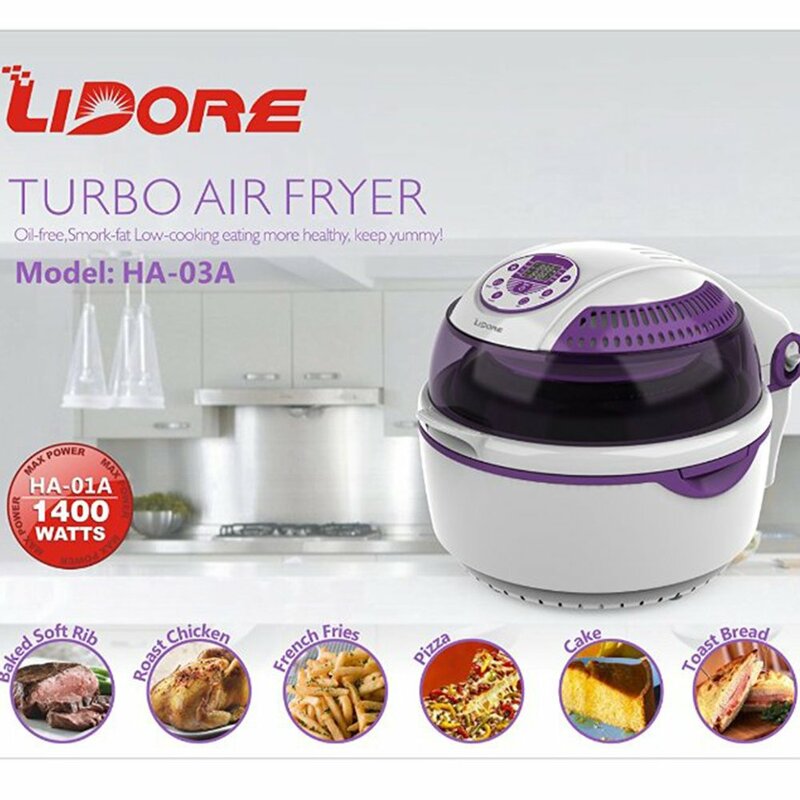 This Lidore air fryer comes with rotating parts. This is great because it allows you to easily flip or rotate foods while cooking. This is especially helpful for the skewer, which lets you roast tender, juicy meats. The only downside to the quality of the food is the grilling function. Unfortunately, the air fryer cannot produce the same flame-broiled flavor that you get from a real grill. The Lidore 8-Mode Oil-Less Air Fryer offers a lot for its price. You get a lot more accessories than are included with other air fryers on the market. It also comes with a convenient digital display and incredible cooking capacity. While it is not without a few problems, such as its height and having an unclear recipe book, these can easily be overlooked for all that you are getting for its price. This is definitely an excellent choice for couples, small families, or people who like to host dinners.